In August of 2013, David and I had the pleasure of taking Eric Shelley with us on our second visit to White Oak Pastures in Georgia to meet with Will Harris. Having these two phenomenal farmers meet each other was rewarding for us. Will Harris graciously gave Eric a tour of the farm and the abattoirs. He never skipped a beat in regard to explaining his passion for being the herdsman and the land steward that he is. 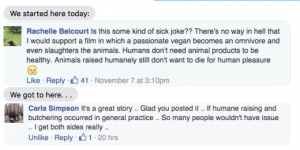 He and Eric saw eye-to-eye on every aspect of animal welfare and humane slaughter. 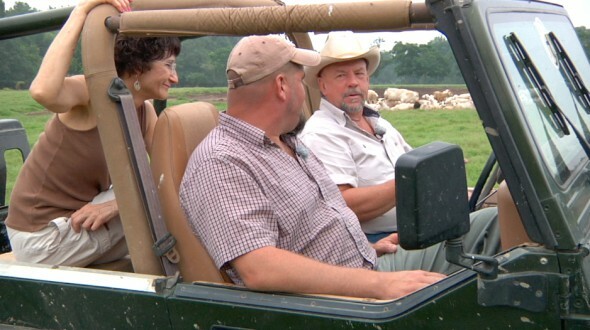 While driving through White Oak Pastures in Will Harris’ Jeep, we had a lot of time to talk about what it means to raise animals for meat. Eric spoke about how he ethically believes that if he is going to eat meat, he needs to understand what goes into it. He doesn’t feel that he can make any judgments about it unless he is aware of the whole process. Will expressed how animals don’t voluntarily sacrifice themselves to be our food and fiber and leather, but they do make the sacrifice. And he is glad that some consumers are willing to learn about meat production in detail. Eric was fascinated by the precision and skill evident in Will’s poultry abattoir. Will was sure to give Eric the time he needed to take it all in. Will Harris graciously gave his entire day to us so we could understand all aspects of his farm and the abattoirs. He took a special interest in “talking shop” with Eric about what it means to be a land steward, herdsman, and environmentally conscious meat processor. We relished when we got to go right into Will Harris’ cow herd. They were very curious and even took turns in “tasting” the Jeep! As Will explained to us, “Their noses and tongues are their hands.” He also told us about how it is a “closed herd on the maternal side.” That means, as Will told us, that “all female cows on the farm were born here, and their mamas were born here, and their grandmamas were born here, and their great grandmamas were born here – for hundreds of generations back to 1866 when my great grandfather brought a herd here.” The important feature of this is that the “cows fit the land.” Will doesn’t need to use fly control or antibiotics. 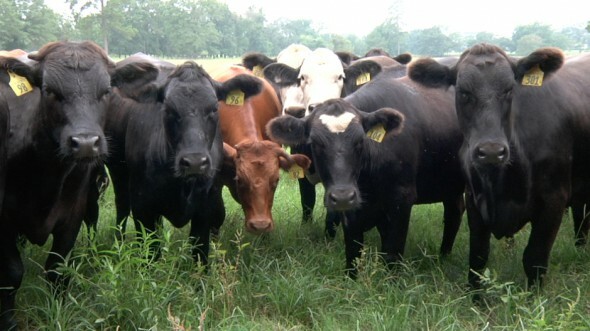 The cows don’t get sick because they have a great immunity to any pathogens on the farm. We were also very fortunate to meet Brian Sapp, the Director of Operations. Eric and Brian had a lot to talk about in regard to how much skill and perseverance is needed when working with live animals in the processing plant. Brian took time out of his busy day to show Eric all aspects of the meat-cutting operations. It is amazing how many details go into assuring food safety. 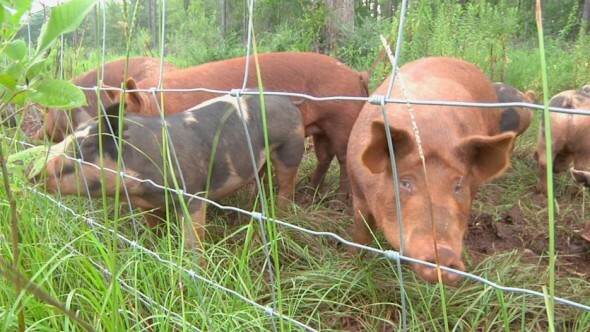 When we were at White Oak Pastures in August of 2012, Will Harris was just beginning to make arrangements to raise hogs. It was lovely to finally see them, particularly in this wooded habitat where they could root around freely and wallow in the mud puddles. At the end of the day, we all sat down in Will’s office and reviewed some of the footage from previous shoots. We were happy to be able to share our work with both of them present and appreciated their feedback.